YOU ARE HERE » Home » Blog » You Are Vulnerable; Are you Prepared? What’s the difference between Las Ramblas, Barcelona and any of the following locations? Any other of over 100 popular entertainment districts around the United States. Ladies and Gentlemen, our world, our hospitality world, is absolutely changing and changing very fast. We must wake up and start to prepare immediately. 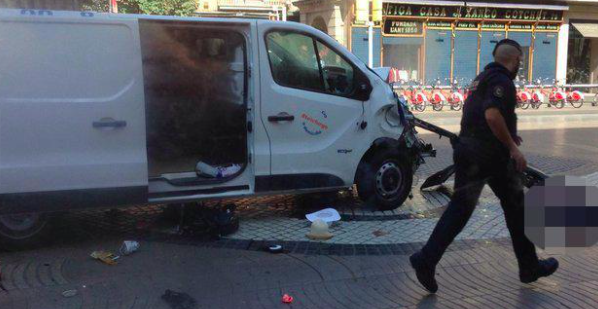 The vehicle attack on the poor people who were just enjoying themselves in cafe’s, bars and restaurants in the Las Ramblas, Barcelona entertainment district is just another terror attack that MUST push us to re-examine what we’re doing to protect ourselves and our guests. Talking is a good start but we must come together and acknowledge that talk isn’t enough. No talking and not even training will tell you when a car or van is going to drive down your busy city street, accelerate and start mowing your guests down as they enjoy a meal or drink on your patio. This is the time to plan. So, what about this; Get your team trained and ready for AFTER an event similar to what happened at Las Ramblas. Provide your team first aid training and purchase the correct first aid kits for helping mass casualties. There is no downside to this. What about instead of a wrought iron fence for your patio, you spend the money to have your patio area surrounded by 4-5 inch thick metal ballards? These ballards should be installed 1-2 feet into the sidewalk and stand a minimum of 4 foot high. They don’t have to be plain or ugly, but instead can be steel incased or perhaps polished stainless steel. How bout a better construction plan for your city? Talk to your city planners and get them to see the safety benefits from a better way to create a safer entertainment district. The idea may seem daunting and perhaps impossible, but trust me, someone MUST have the conversation. Why not you? If not you, who? Look, I don’t have all the answers but I’m trying. I’m not the type to just talk about problems, I like to find and present solutions. AND, I refuse to let this latest terrible tragedy come and go and let my industry not at least hear someone talking about CHANGE. Please believe me folks, our industry will never be the same and we must admit that a domestic or international terrorist can use a vehicle as their deadly weapon of mass murder on any day or night. We must accept it and WE MUST BE PROACTIVE in finding potential solutions. Good Luck Everyone and Be Safe.